Thalassa Residence in Mykonos, Greece. Check for availability! 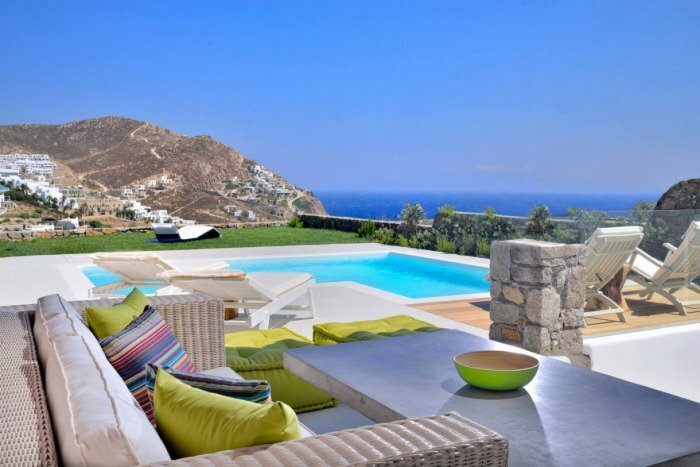 Thalassa Residence is a new luxury residential complex located in the southern part of the island of Mykonos, above the famous Elia beach and it is 10 km away from the main town (Chora) and the Airport. The complex consists of 3 independent luxury villas - Castalia, Kimothoe & Galatia - fully equipped - furnished, each one with its private swimming pool, private garden with amazing uninterrupted sea view and can accommodate up to 21 people! The villas are inspired by the Myconian architecture which consists of built-in furniture and the traditional Cycladic stone that dominates all external surfaces of the local houses. Their location is premium, because they are in the southeastern area of the island, which is wind protected and only 600m from Elia beach and 1,5km away from the beaches of Kalo Livadi and Kalafatis. You'll have a hell of a time during your stay. It's not a movie... it's your own luxury holiday! We wish you a comfortable and pleasant stay in Thalassa Residence! Very nice everything was perfect! Fantastic location, very nice view, extremely quiet area and yet you are within 1 minute of the beach! Villa top, modern and truly luxurious. Really gorgeous villa, believe the photos! Every bit as beautiful as the photos. Well designed, with lots of different sitting / lazing around options outside in both sunshine and shade. We had a really lovely week in your beautiful villa. We hope to be back in the future to enjoy the wonderful views & gorgeous weather. Thank you for the lovely house, the wonderful service and the excellent memories!